Do Tree Rings Really Indicate Age? | Mr. Tree, Inc.
Have you ever come across an old tree stump and started counting the rings? The adage says the tree rings indicate how old a tree is, but is that really true? Those tree rings tell you how old a tree is, and more. Trees are nature’s environment log books. They can live hundreds or thousands of years. Every year brings on new circumstances and experiences. And as a tree survives all that nature throws at it for the year, it records in the growth rings of the tree. Dendrochronology is the science of studying these experiences. It works to date events and environmental changes through the study of tree rings. Scientists have been studying tree rings for centuries and have used that data to learn more about climate, atmospheric changes, and the local geography. These growth rings indicate the age of the tree, plus they leave clues to help you understand the climate conditions the tree lived through. What is a Tree Ring? When you look at a tree stump, you may see that the top of a trunk has a series of rings. It starts with one small ring in the middle followed by a continuum of circles with each circle encompassing the one before it. The center circle indicates the first year of growth. Each ring afterward indicates another year as well as the climate condition of that time. These growth rings grow under the bark, and the bark is pushed out while the tree grows. Tree rings are created because trees manufacture new cells every year. These growth layers act as a timeline of a detailed report on its growth throughout its time. Trees learn to survive with the different climate conditions, and the tree rings help us understand how. In the United States, the tree-growing season starts in the spring. When you look at a tree sample, this season is shown by light-colored, pale wood. Growth slows down at the end of summer, which creates smaller walls and darker colored wood. A one-year cycle is comprised of a light pale wood that grew at the start of the year and a dark wood that grew at the end of the year. 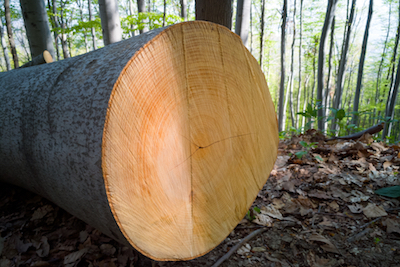 When a tree is cut, you will notice alternating light and dark wood rings. Count the dark rings, and you will get the tree’s age. Fortunately, you don’t have to cut a tree down to study its growth rings. A boring tool is used to get a tree sample to analyze tree rings. It excretes sections of wood by screwing into a tree to get a straight, unbroken sample of the core. It is a T-shaped tool, and the professional tree service company you work with will have these on hand. Your arborist in Portland can take the sample. They will know how to cover up the hole from the sample excretion to keep the tree alive. They will also be able to identify the dead trees to work with and avoid damaging healthy ones. Count the tree rings, and you will find some trees have up to thousands of rings. Examine more closely, and you will see different shapes, sizes, consistencies and gaps which indicate the conditions the tree lived through. A typical tree will have tree rings with different variations that signify its life story. The layered growth indicates the climate conditions such as drought, fire, insect attack, flood and many more natural disasters that we wouldn’t have been able to trace by ourselves. Variation of tree rings occurs because of the different conditions each tree faces. Trees are sensitive to climate, which is why they help indicate the environmental condition at a certain time. That’s why it’s always a good idea to take samples from more than one tree to compare and eliminate individual variations. If it’s a difficult year, a tree produces a thin ring signaling slow growth. This indicates a cold and dry year. When it has positive-growth conditions, a thick ring is produced because of the added tissue the tree produces for fast growth. A thick ring indicates a warmer wet year with abundant rainfall. Consistent tree rings signify a consistent climate throughout those years. Thin rings may also occur because of overcrowding of trees, which limit the tree’s growth. Trees that have plenty of space to grow straight at a rapid pace will have wide, evenly spaced rings. Narrow rings for several seasons can also indicate drought because of the lack of water over a long period of time. Insect defoliation also creates narrow rings. Each kind of insect will leave different traces of its presence, and this can help understand insect productivity and infestation. Narrow rings also indicate forest fire damage. When trees are injured they develop boundaries around the tissue to prevent infestation. If the tree lives on, the tissue becomes the new layers of wood around a tree trunk. A damaged bark and exterior is a forest scar. While forest scars vary based on species, they all result in narrow rings due to the discouragement of growth. Tree rings that are wider on one side mean that something was pushed against the tree while it was growing. The tree starts to lean because it produces wood to react to the other subjects. Since trees can live thousands of years, scientists use trees to determine the events of the past. While there are new trees constantly being planted, scientists can focus on old trees to get a clue of what the climate was like even before the measurement was being recorded. Through tree rings, we can understand the occurrences of natural events, and this can help us understand the future of potential environmental circumstances. While we can’t control the weather, our pros at Mr. Tree can offer planting and care for your trees to ensure a long and healthy life. As arborists in Portland, we use environmentally friendly practices and a holistic approach to ensure all aspects of your landscaping will thrive. To find out what other professional services are offered, visit https://www.mrtreeservices.com/.